After having typically appeared in the hallowed pages of Baseball Think Factory, Dan Szymborski’s ZiPS projections have now been released at FanGraphs for more than half a decade. The exercise continues this offseason. Below are the projections for the Oakland Athletics. From the projections, one can see why the A’s let Jed Lowrie go so easily, despite his legitimate star-level performance in 2017 and ’18. 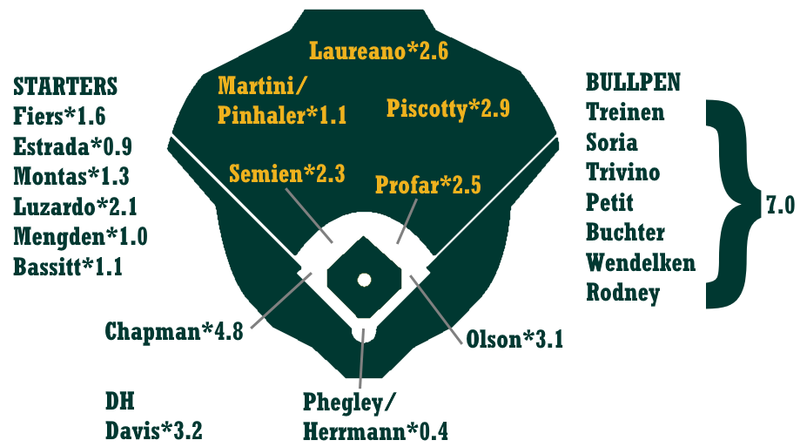 Five Oakland infielders — the starters plus Franklin Barreto — project to be league-average or better. Now, none of them project to reach the level of Lowrie’s 4.9 WAR in 2018, but then again, neither does Lowrie, and mid-30s middle infielders tend to have pretty steep aging curves. And really, if anyone thought Lowrie was going to perform at an All-Star level again in 2019, he likely would have done better than two years and $20 million. Jurickson Profar projects to be a worthy replacement for Lowrie, and his return from literally years of injury and then underperformance is one of my favorite stories in baseball. Except for catcher and the four-headed chimera in left field — at least, as our depth charts have it figured so far — the A’s project to be average or better, and sometimes significantly so, at every position. Perhaps ZiPS is trying to do penance for missing on the A’s by something like 20 wins in 2018. Don’t get too excited about the Matt Olson comp; this version is from when Ortiz was still in the “Wait, is that the same guy as David Arias?” portion of his career, before he became Big Papi. Ok, the highs are not very high. That’s due in large part to the fact that ZiPS is projecting fairly low innings totals for Oakland’s pitchers across the board. The system is aware of the injuries to Sean Manaea and Andrew Triggs in very general terms, so these aren’t theoretical “healthy” projections. As such, Manaea’s projection isn’t unexpected, but Triggs’s was a legitimate surprise to me. But again, I’m going to de-wind your sails a little bit by noting that ZiPS sees the Triggs injury as a generic “shoulder” ailment because I don’t have the data on thoracic outlet syndrome recoveries that I do with those from Tommy John. Regardless, this is an injury that you really don’t want. The rotation’s highs may not be very high, but ZiPS sees the group as incredibly deep. 18 pitchers project to be worth at least one WAR if playing in the majors, and though a few of them are relievers (Blake Treinen, Lou Trivino, and Joakim Soria) and Brett Anderson is a free agent, that’s still a lot of options. I hope that someday I can love somebody or something the way ZiPS loves Jesus Luzardo. No, the computer isn’t projecting him to actually have Steve Carlton’s career, but who wouldn’t take that as a top comp? ZiPS already sees Luzardo as the team’s best starting pitcher, a pretty shocking projection for a guy who started the season in A-ball and whose parent club isn’t, say, the Baltimore Orioles. It also interests me that ZiPS pegs Sean Murphy as the team’s best catching option. I’m definitely interested to see where he falls on the McDongenhagen prospect list; he ranked sixth last year, but after a .285/.361/.489 year and a finish at Triple-A, I would imagine he’s moved up. Conversely, Oakland cooled on Dustin Fowler and now largely sees him as a fourth outfielder. Overall, ZiPS sees a lot more of interest in the minor league pitchers than the hitters. We hoped you liked reading 2019 ZiPS Projections – Oakland Athletics by Dan Szymborski! Don’t lie. You manually adjusted Khris Davis’ hit and at bat total. I don’t care how you weigh each of the past three years, it still averages to 0.247. Dude will hit .247 (with declining power) until he’s in his mid 40s. Brace yourself if he ends up hitting .246 at 45, everyone. Even Julio Franco experienced a dip. I certainly hope ZiPS is more advanced than weighting batting averages to project a batting average. There’s a lot goes into that number.